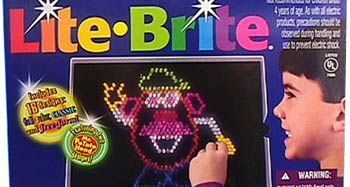 When I was a kid I loved to play with Lite-Brite. I creatively fit small colored plastic pegs into a panel on a light box that illuminated my masterpieces. The brightness of the colors was greater than I could achieve with my crayolas. I needed the spike that came from my eyes mainlining the vital color eruptions. I realized I would never be recognized for my electric light talents unless I devoted myself to a work of such greatness that it would certainly hang in a dark room at the Blowser Community Art Museum. So I devoted myself and was 14 hours into what I was sure would be my Lite-Bright Magnum Opus when my sister surprised me with a shot from her water pistol. The water splashed onto the Lite-Bright and I got electrocuted. Suddenly the room disappeared and lights rapidly flashed past me. I figured I was dying, which was exciting because I thought I would certainly become famous for the creation I left behind because being dead really helps an artist’s career. But suddenly I was still alive and on the cold floor of a mildewed artist’s studio. I got excited again because I’d read the autobiography of the great sculpturer Rodin, and in it he shared how his work only really took off after he had a mystical vision. A long haired and bearded mysticalized man was charcoal drawing an image of a woman. He looked over at me and did one of those things where one of a person’s eyebrows raises higher than you think it ever could. He began to include me in the drawing. As you might have inferred, I like attention, so I began to pose. I did the haughty look over the shoulder, followed by touching my bottom lip as I looked up and pondered, and of course, the pout. After a few minutes, I got dizzy and things got blurry, and the room disappeared and the flashing lights returned. Suddenly I was back home, laying on the floor with an incredible headache. 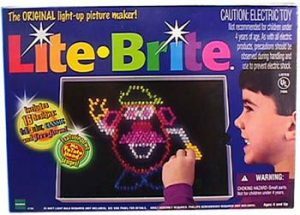 My Lite-Brite was smoking. The plastic pegs had melted into the panel. All the lights in the house were out. As I lay in bed that night, I realized I had time traveled! I looked through my Archie Comic’s History of Art and came across a cartoon of Leonardo da Vinci and knew that’s the man I’d posed for. I got excited and woke up my sister. She panicked and covered her head because she thought I was going to clobber her for the electrocution. I said I wouldn’t and told her what had happened and that I needed her help to do it again. We snuck downstairs and went into the living room. I turned on the TV and hugged it while my sister poured a water pitcher over me. There was a loud crackling sound as the TV shorted out and smoke billowed. I got a slight buzz but I was still in the room. My parents ran downstairs in a panic, thinking the house was on fire. Once they figured it out, I saw this look of disappointment pass over them that sent shivers down my bones.